When I look around my blog I think the last word I would use to describe my food is traditional. More often than not my recipes are a twist on a classic – a traditional idea that has been warped either to be healthier, more exciting, or to simply use up the ingredients I’ve got in the cupboards. With that in mind, this is probably the closest I will ever get to a traditional recipe. A peek of the inside! And look at that crispy top! Another great thing about this recipe is that it is made best with leftover roast chicken. You can make it with chicken breast if you chose but I prefer using all the yummy meat off the carcass,: both white and dark. It also means that it’s really quick to make with just the vegetables to prep before cooking can begin. Another plus is that the vegetables used are also the kind of veg you’d expect to have in the fridge – made with carrots, leeks and peas! Don’t be afraid to throw in anything you’ve got though: broccoli and green beans also work really well. Pre-heat your oven to gas mark 4. In a large pan begin to lightly fry off your leeks and diced carrot for 5mins until they begin to soften. Add in the cooked chicken and other vegetables and cook until the chicken begins to brown (roughly another 5 mins). Add the plain flour and stir thoroughly so that all of the ingredients are coated. Pour over the vegetable stock and season heavily with black pepper. Let the pan simmer gently for 10mins. Once the stock has begun to reduce down, stir in the crème fraiche to make a creamy sauce. If it is still a little thin let it simmer until the sauce has a silky, creamy consistency. Next, stir in the mustard and add in the ham (either chopped or in strips). Pour the pie filling into a pie dish. Top the dish with scrunched sheets of filo pastry. Using an oil spray spritz the top of the pastry with a little oil. Place the pie in an oven for 30mins at gas mark 4-5. Once the filo pastry has crisped up and the pie mix is bubbling serve alongside salad or green vegetables. So there it is! It’s incredibly simple to make and is packed full of flavour. If you love mustard feel free to add in more. 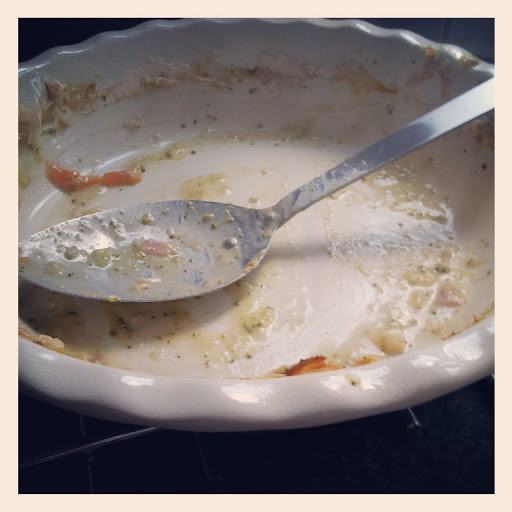 Taste your sauce before you put it in the pie dish to see if it needs that bit extra heat for your family. I’ve suggested serving with either salad (great for summer) or yet even more vegetables (better for winter.) There’s plenty of chicken (and ham) in the pie that I think it can take the extra “greenery” on the side. My favourite thing about this pie though has to be the filo pastry. 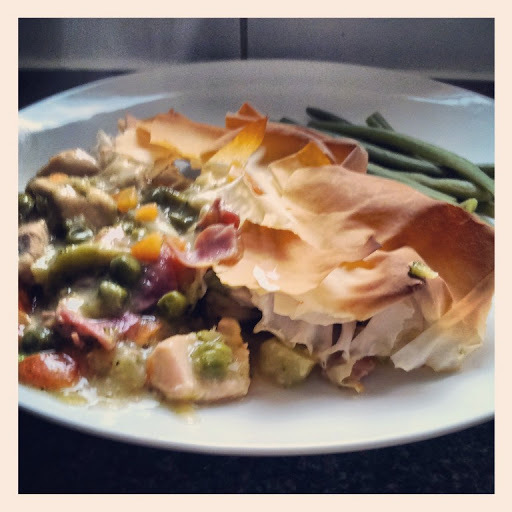 It gives a brilliant crunch to the dish which is incredibly satisfying – and dare I say it, I prefer the filo to a short crust or even a puff pastry pie! To the vegetarians among my readers, watch this space because I have another filo pastry pie that I will be cooking again in the next few weeks. This time it is fully encased in filo. Come back soon for the recipe! Wow looks lovely! I make chicken pie a lot but always wuth shortcrust. Need to try this! 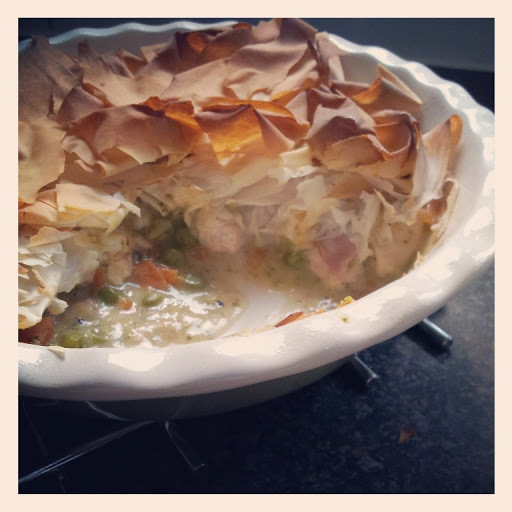 There's nothing like a pie and it's a great way to use up the excess cooked chicken. I always liked a thick pastry that soaked up the filling in chicken pies but I've got to admit that the filo texture is very satisfying too and just a bit addictive. I'm looking forward to the fully encased filo pie.